The Earth is our Mother. This is of course a symbolic, metaphysical statement, but it is also a truth. We are born from Her, She nurtures us. The food we eat grows from Her, the air we breath is Her air. Every atom in our body comes from chemicals occuring naturally on this planet, we are quite literally "of the Earth" - interconnected and part of a whole. And moreover, at some time in the cycles of the ages, each one of those atoms was a particle somewhere else here, in another creature, in a rock, in a plant, in the soil, floating freely in the atmosphere. Matter can neither be created nor destroyed, only changed, and so it is with the "dust" that we are made of. Ultimately this is star dust, carried on the cosmic wind, but for billions of years it has been Earthbound, and as such our home planet, our Mother, is not just an ecosystem but a living entity, known to some of us as Gaia. It is unique as our only home, a beautiful blue globe, 3rd rock from the Sun. From this vantage point it is easier to see the Earth as a wholeness, an item, even knowing there is so much diversity upon it, it all spins together, and everything is dependant on everything else. The web of life, a symbiosis. It looks calm and peaceful from space too, and of course scenes like the idyllic rural one above certainly are the epitome of peace. But we all know that the Earth began in chaos, was etched and sculpted by the violence of volcanoes and seismic quakes, and is still powered by the inferno at its core, and warmed and sustained by the even hotter Sun, and here is an example of two of the elements, earth and fire, depending on each other. My aim is to explain how this complex relationship, along with that between the other elements, is both symbolic of the wholeness of existence, and also the basis of life as we know it. 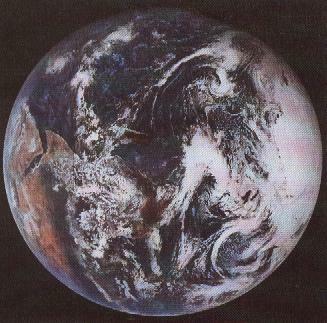 In English we know it as Earth, originally Erthe, from a German word Eorthe, which may possibly be related to the fertility Goddess Nerthus, as this is a common practice, for example the Greek word for Earth, Ge, is presumably related to Gaia, the Earth Goddess. The Earth is thought of as feminine in most traditions, with the sky being masculine, this is even so in ancient Hebrew. The union between the two is the beginning of life on Earth in scientific theory and a myriad of mythologies. Our earliest ancestors seemed to have had an instinctive understanding of their connection to the Earth, that they came from Her, and ultimately returned to Her. One of our earliest clues to humankind's awareness of the spiritual aspect of the cycle of nature, is the practice of ritual burial, particularly in mounds. Not limited to any one culture, huge mounds, many times larger than the tomb they contain, are found on every continent. 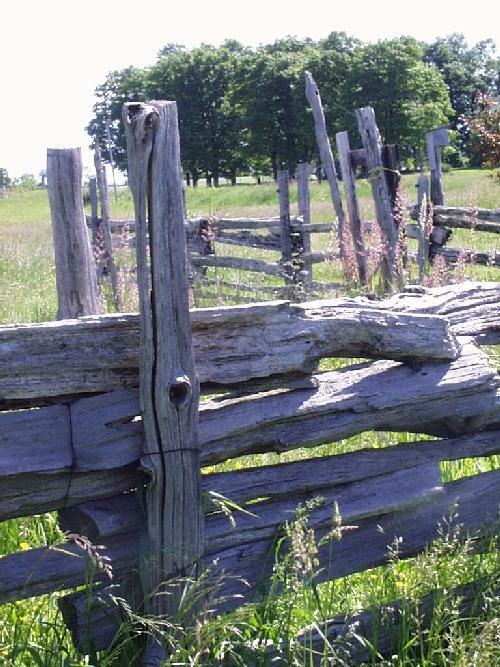 Often local people are unaware that they are not natural features of the landscape. This one, in Chilicothe, Ohio, was built by the Hopewell Indians, but is indistinguishable from those in Ireland, Denmark, Bahrain, Kenya, Japan, Guatemala, and so on. The work involved in the construction of these tumuli suggests far more than a practical purpose, and it is obvious there was a religious motivation. 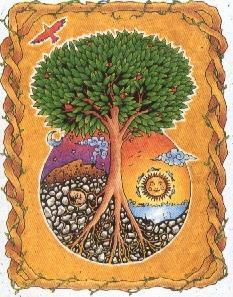 In this illustration the symbolic role of the Earth as nurturing Mother is depicted by a tiny fetus growing underground, with a tree root as umbillicus. This is the archetypal tree of life, it's roots equal in spread below, as its branches are above, a mirror image of fertility/sustenance and growth/blossoming. The tree is an important symbol representing the Earth, and is therefore sacred in many traditions, especially trees that grow to a great age. So Earth is associated with life and death, the beginning and the end, or to be more accurate, parts of the cycle of life. The alchemical symbol for Earth, shown either side of the title at the top of this page, is a downward pointing arrow with a crosswise line. Other symbols used to represent Earth are the square, the equal-armed cross, and the square or circle with an equal-armed cross inside. Traditional Earth associations and correspondences include the Mother aspect of the triple Goddess, soil, rocks, wheat and acorns, the metals lead and iron, the herbs patchouli and vetivert, the gemstones emerald, peridot, and malachite, the animals dog, horse, cow and ant, the planets Venus and Saturn, the direction North, the angel Auriel, the wind Boreas, the guardians the Gnomes, the season Winter, the time Midnight, the phase the New Moon, the magickal tool the pentacle, the altar representation salt, the time of life Old Age, the festival Yule, and the colours green, brown, and all "Earthtones".